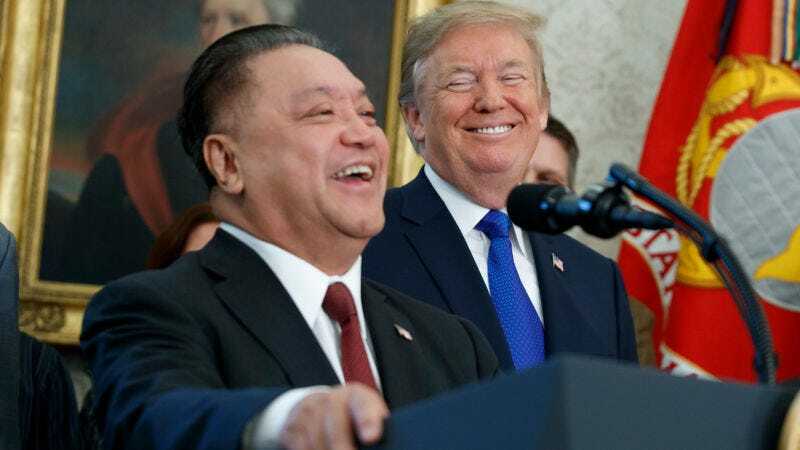 Singaporean mobile chip manufacturer Broadcom says it is now again a US-based mobile chip manufacturer, Reuters reports, even after the White House blocked its planned acquisition of US rival Qualcomm on national security grounds. Per Reuters, Broadcom announced on Wednesday it had completed transitioning its corporate headquarters from Singapore to the US—a move that just months ago, President Donald Trump had celebrated alongside CEO Hock Tan as an opportunity to bring jobs and $20 billion in investment stateside. The amicable relationship quickly soured, because Broadcom’s relocation seemed in large part intended to dodge concerns from the inter-agency Committee on Foreign Investment in the US (CFIUS) that its massive planned acquisition of Qualcomm would result in the new owner slashing the budget of Qualcomm’s US-based research and development units. The committee was concerned the merger could potentially put countries like China ahead in the race to develop mass-market 5G technology, as Chinese tech giant Huawei is one of Broadcom and Qualcomm’s biggest customers for both phones and telecoms equipment. CFIUS had even warned Broadcom, which was until 2016 a California-based firm, not to continue trying to dodge its oversight power by moving back to the US, per the Wall Street Journal. Trump then ordered an immediate halt to its Qualcomm plan in March when it kept moving forward. So it looks somewhat like Broadcom gambled on an end-run around regulators, and when that failed, was left holding the bag on the relocation anyways. As Reuters noted, though, the company’s completion of its US relocation could clear the path for Broadcom to begin gobbling up other companies stateside regardless. It will still also benefit from the Republican Party-backed effort to slash corporate tax rates, one of the other publicly floated reasons for the move. It’s not clear whether Broadcom could take another run at Qualcomm in the future, this time without CFIUS intervention. The acquisition would have been the biggest tech deal in history at somewhere around the $105-130 billion range in total. Remember that, at least initially, this was a hostile merger. As the Register reported, Qualcomm warned its shareholders not to sell out to Broadcom, saying that antitrust authorities in the US, Europe, and Asia would likely all shoot down the deal on the grounds it would essentially create a three-player worldwide chip market between the combined company, Intel, and Samsung. Qualcomm later warmed to the deal somewhat amid concessions to regulatory concerns, like the possibility of selling off its Snapdragon chip business. In any case, blocking the acquisition preceded Trump’s obvious attempts to push the US and China into a trade war, something that is ongoing at this moment.